The ball is a runner heading for second base. 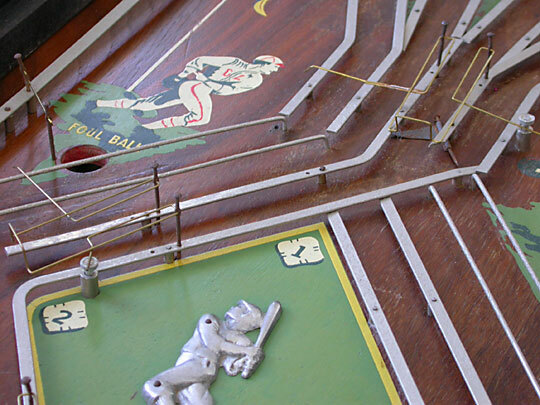 The ball lifts the wire frame and is about to arrive at second base. 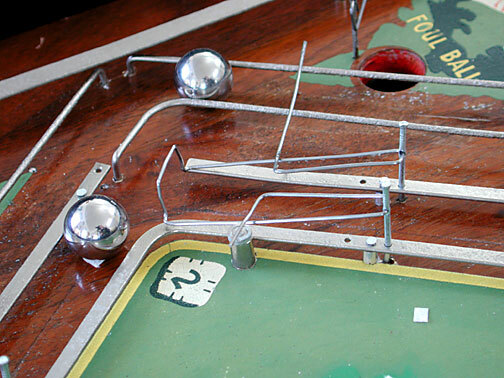 The runner (ball) stops at second base and is held by the square of the wire frame. This completes the double hit by the player. A second double is made by the player and the runner is approaching second. 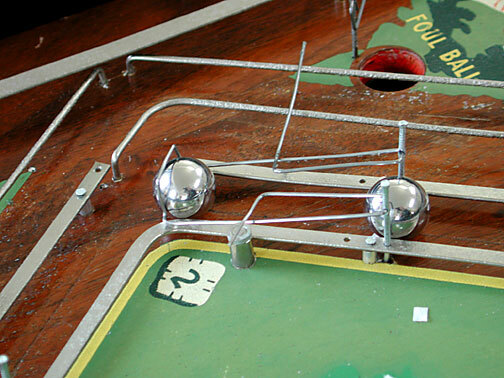 The second ball goes under the wire frame and lifts it sufficiently to release the ball that is currently on second base. The first ball is now released and is headed for third. The second runner is now stopped at second and awaits another hit. This completes the hit. With a runner on second, a batter has hit a home run. The home run ball is advancing down the far channel. The home run ball is lifting the gate and passing on by. This will release the base runner on second. The home run ball and the base runner on second now both are headed for third. keep the base runners in order. The wire frame is carefully designed to serve multiple functions. 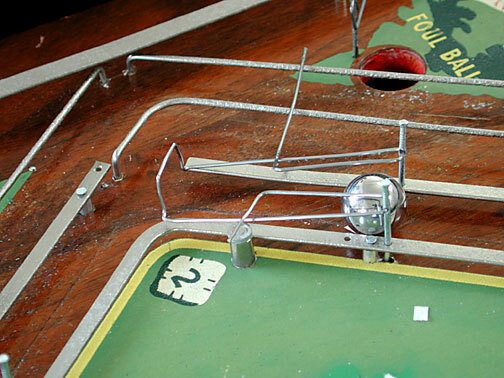 The first ball is allowed under the ramp of the wire frame but is captured by the square end. 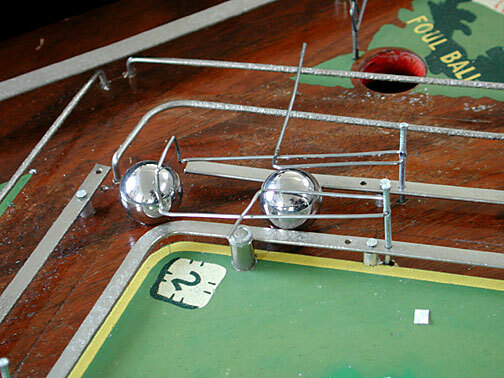 The second ball will release any balls already captured by raising the gate. Unfortunately the release ball must start rolling and will not keep up with any balls in the upper channels. A hit that advances the base runner, such as one coming in one of the two upper channels, will release the base runner at second and will continue on. Note the reset button just to the right of the second base drawing on the diamond. 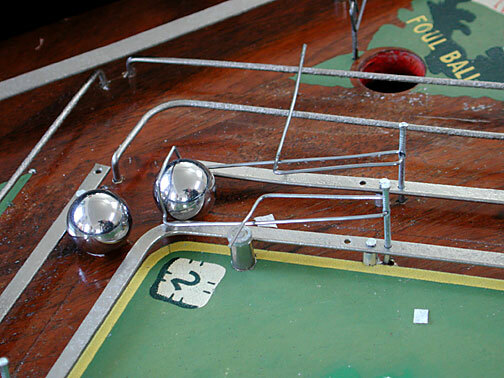 This button raises the wire frame and releases all balls when the coin slide is pushed in. The adjustment and shape of the wire frame is absolutely critical to proper functioning. The depth of the ramp that raises the wire frame, the distance from the end of the wire ramp to the square gate, and the shape of the square gate are all critical. The base runners do not maintain their correct positions when running the bases. View this animation of a home run to see some of the problems. 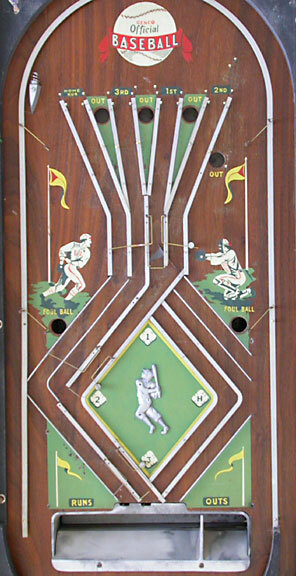 The picture of the playfield below shows the various channels allocated to each hit and out. Reading the gates from left to right, Home Run, 3rd (triple), 1st (base hit), and 2nd (double). You can see the gates that control first, second and third bases. 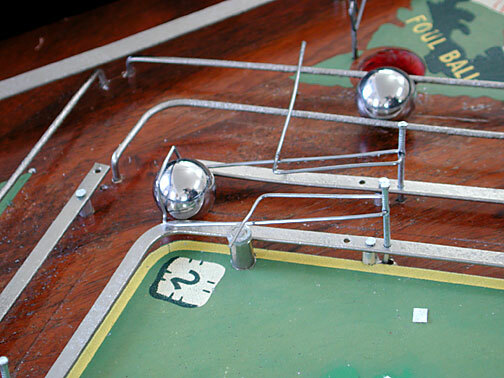 See if you can simulate the balls for a single, double and triple in the gates above.